On Jan. 21, the operations team successfully tested the New Horizons Radio Science Experiment, taking advantage of an Earth-moon-spacecraft alignment to simulate atmospheric measurements “REX” will make at Pluto in 2015. REX is integrated into the spacecraft communications system. New Horizons might be more than two billion miles from home, but the spacecraft has spent most of the new year at the fingertips of its operators. Since waking the spacecraft from hibernation on Jan. 3, the New Horizons mission operation team at the Johns Hopkins Applied Physics Lab in Maryland has uploaded a new set of commands to the spacecraft’s computer; made sure its digital data recorders were in working order; primed the communications system for testing of the Radio Science Experiment (REX); refreshed the memory on one of the Guidance and Control processor memory banks; and prepped the Solar Wind at Pluto (SWAP) and Pluto Energetic Particle Spectrometer Science Investigation (PEPSSI) instruments for more than three months of science-data collection. The team returned the spacecraft to hibernation today. The commands – transmitted, like all communications with New Horizons, through NASA’s Deep Space Network – will guide activities on the spacecraft until May. In recent weeks the team also partially filled both of the spacecraft’s digital data recorders with a “test pattern” –ones and zeroes – to check that the recorders could both absorb and download data without problem. And they also carried out a small maneuver on Jan. 24 to precess New Horizons’ antenna toward the point where Earth will be on April 30, for the start of the annual spacecraft checkout. The REX tests took place on Jan 21. The team took advantage of a fortuitous Earth-moon-spacecraft alignment that allowed it to simulate the occultation technique New Horizons will use in 2015 to probe Pluto’s atmosphere and to search for an atmosphere around Pluto’s largest moon, Charon. 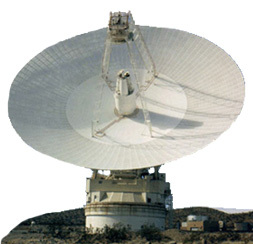 During the actual encounter, after New Horizons flies by Pluto, its 83-inch (2.1-meter) dish antenna will point back at Earth. Powerful transmitters in the largest Deep Space Network antennas will beam radio signals to the spacecraft as it passes behind Pluto, and then Charon. The radio waves will bend by an amount that depends on the average molecular weight of gas in the atmosphere and the atmospheric temperature. After this month’s wakeup, the SWAP and PEPSSI instruments will be turned on to collect, for the first time, an extensive amount of science data during a hibernation period. A test last fall showed the instruments could work without “distracting” the super-sensitive Venetia Burney Dust Counter, which records “hits” of tiny space-dust particles and is typically the only instrument that operates during hibernation. The team will download the data from the REX, SWAP and PEPSSI activities in May, during the annual checkout. Results from the Student Dust Counter instrument were recently published in the Geophysical Research Letters; click here. During January the operations team gathered tracking data – valuable for spacecraft navigation – using the regenerative ranging technique. 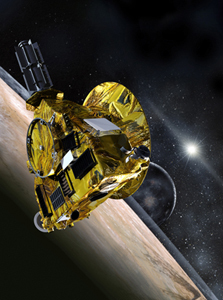 New Horizons is the first mission to use onboard regenerative ranging to track the distance between the spacecraft and Earth. Here’s how it works: When a spacecraft is far from home, the ranging tone sent from the ground to measure distance is weak (or “noisy”) by the time it reaches the spacecraft’s communications system. In normal ranging, the spacecraft simply amplifies and sends the noisy tone back to Earth, which adds errors to the range measurement. In regenerative ranging, the spacecraft’s advanced electronics track and “regenerate” the tone without the noise. The ground station on Earth receives a much clearer signal – giving navigators and operators a more accurate lock on the spacecraft’s distance, and improving their ability to guide New Horizons through the solar system.